Casita Corda is a pretty country house full of character and charm sitting on a private & peaceful plot of land. Its simple but stylish decor make for a calming space to spend some time. The private land outside the house provides a quiet and comfortable area to chill out and the seas edge is only a 5 minute cycle ride away, making it an ideal little base to unwind from the stresses of life or for exploring the wonders of Formentera. Casita Corda is furnished in a minimal Formentera country style, with white walls providing a calm light atmosphere. This authentic detached country house has 2 double bedrooms, 1 upstairs & 1 downstairs, and both being accessed off the lounge area. There are 2 bathrooms, with one as an ensuite to the lower bedroom and the other accessed through the fully equipped kitchen. This little star has all the modern conveniences including internet, burglar alarm, stereo, and television, while the fully equipped kitchen includes coffee maker, microwave, dishwasher and washing machine. Outside, this cute casita packs all you need for a Formentera summers day, including sunbeds, parasols and a barbeque. Close by are many trails & paths for long peaceful walks, jogging or cycling, even in the busiest season. Cala Saona beach is a 10 minute drive away or a 5 minute cycle ride to the seas edge and a lovely walk along the cliff edges to the beach. The closest shop is at bar es cap 10 minute drive away and also restaurnts. 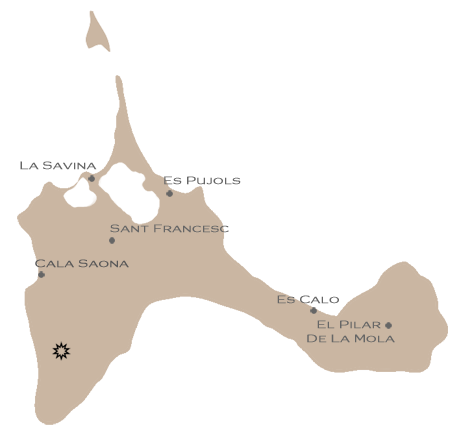 Nearest town is San Francesc, not far up the road for all amenities. The lighthouse of Cap barbaria is 3 km away.